The Reverend (now Bishop) Hamel Hartford Brookins became one of the leading black ministers and civil rights activists in Los Angeles in the 1960s. Brookins arrived from Wichita, Kansas in 1960 to be the new pastor of the First African Methodist Episcopal (AME) Church in Los Angeles. 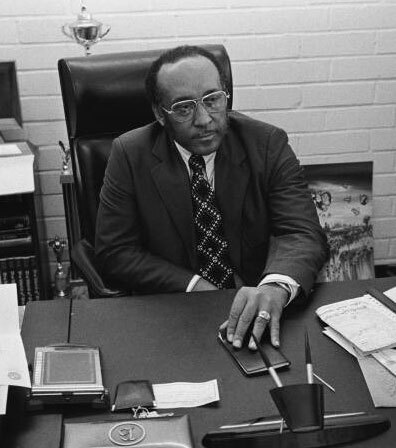 Shortly after his arrival, Brookins helped form United Civil Rights Committee (UCRC). Brookins and other members of the UCRC prodded city leaders on issues including housing, education and law enforcement. Brookins’ efforts helped unite blacks in Los Angeles, at least temporarily, in the early 1960s around those issues. One of Brookins’ earliest efforts was his involvement in securing representation on the Los Angeles City Council for African Americans. Brookins played a key role in uniting black community support behind three candidates (Tom Bradley, Billy Mills and Gilbert Lindsay) all who were elected to the council in 1963. Brookins and the UCRC also led unsuccessful efforts to end segregated schools and housing discrimination in California. Brookins also challenged Mayor Samuel Yorty’s attempts to control the War on Poverty in Los Angeles by seeking more representation of the poor on the local antipoverty agency’s board. Brookins’ opposition to Yorty drew the ire of some of his fellow black ministers, particularly the Reverend E.V. Hill, the pastor of Mt. Zion Baptist Church. This ministerial conflict demonstrated some of the political and class conflicts present among African Americans in Los Angeles. The stalemate over the War on Poverty and the subsequent lack of funding was one of the contributing factors behind the Watts Revolt in August 1965. After the violence, Brookins helped federal officials negotiate a settlement over representation of the poor in the city’s War on Poverty so that the city’s antipoverty agency could start receiving much-needed funds. Brookins continued his political, as well as his ministerial, activities well beyond the 1960s. He actively supported and campaigned for Tom Bradley’s mayoral candidacy in his losing effort in 1969 and his victories in 1973 and beyond. In 1972, Brookins was elected a Bishop of the AME Church, a position which has led to his involvement in international economic development. He has also remained active in Los Angeles, chairing the South Los Angeles Development Corporation, an organization that provides employment for black teenagers. Robert Bauman, From Watts to East L.A.: Race and the War on Poverty in Los Angeles (Norman: University of Oklahoma Press, forthcoming 2008); Robert Bauman, “The Black Power and Chicano Movements in the Poverty Wars in Los Angeles,” Journal of Urban History, 33:2 (January 2007), 277-295. History, 33:2 (January 2007), 277-295. Next Next post: Browne, Theodore R. (c. 1910-1979).